1. The MPOA dredging contractor resumed dredging after replacing the damaged booster pump, and continues to move farther into South Bay. 2. The MPOA dredging consultant is continuing to look into possible alternative dredging options to allow the remaining areas at O’Brien Shoals to be completed. Lake users should avoid the area between O’Brien Shoals and the east shoreline, as well as the Troy Creek inlet at Deep Springs Wood Country beach. 3. Lake users are again reminded that the Nippersink Creek Inlet and entire South Bay have been designated as “No-Wake” areas, and marked with No-Wake buoys. Lake users are also reminded that MPOA decals MUST be permanently affixed to the watercraft it is registered to. The Wonder Lake Marine Patrol has been issuing tickets for No-Wake and decal violations. 4. Due to recent heavy rainfall events, the MPOA has had to impose a “No-Wake” restriction on the lake twice in the last two weeks; first on June 29th, and again today. A “No-Wake” restriction is required when large rainfall events occur. This is because woody debris can wash into the lake, posing potential boating hazards. Wakes generated at high lake levels can also cause damage to shorelines, docks, and moored watercraft. Lake users should also remember that heavy rainfall events are also the most common reason for swimming beach closures, based on water sampling conducted by the McHenry County Health Department. 5. In addition to direct observation of the lake during high water events, the MPOA also monitors the stream gage on Nippersink Creek at Thompson Road. This stream gage, operated and maintained by the United States Geological Survey (USGS) under a cost-share agreement between the MPOA and McHenry County, provides real-time information of Nippersink stream conditions on the internet. There is a link to the USGS website on the MPOA website homepage. 6. The USGS gage measures rainfall amount, stream flow (discharge), and the elevation (stage) of Nippersink Creek at Thompson Road. If there is significant rainfall in the Nippersink Creek watershed upstream of the gage, the volume of flow moving down the creek towards Wonder Lake will increase. The flow is measured in cubic feet per second (cfs), meaning how many cubic feet of water is moving past the stream gage each second. 7. As the stream discharge increases, the water surface will also rise. While none of these measured parameters represent exactly what is happening on Wonder Lake itself, we do know that if there is a heavy rainfall, and we see the discharge and stage of Nippersink Creek increase, we will see higher water levels on Wonder Lake. When we see the stream discharge begin to decrease, we know lake levels will also begin to fall, barring any new rain events. 8. 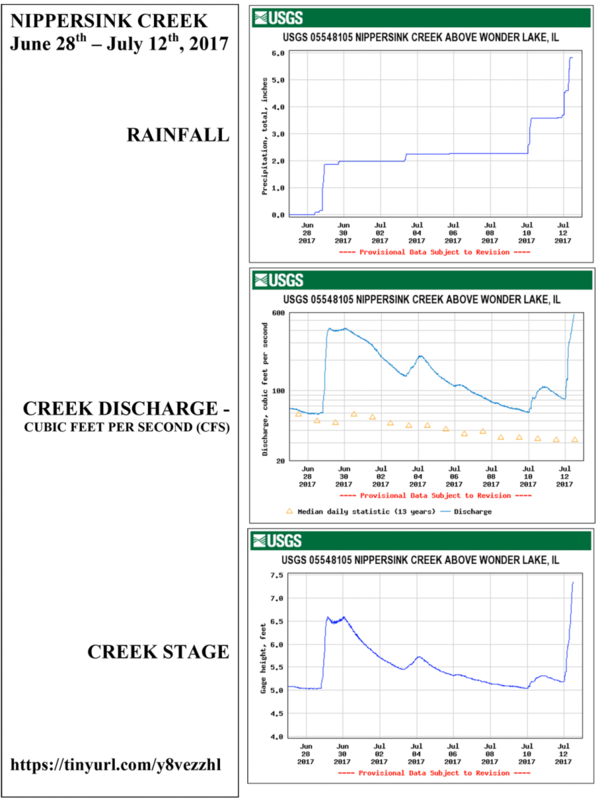 The following graphs from the USGS website depict the Nippersink stream condition’s leading up to the June 29th high water event, and the high water event currently on-going. Since June 28th, the stream gage recorded almost six (6) inches of rainfall; had flow volumes of over 400 cfs on June 29th, and almost 600 cfs today; causing the stream level to rise 1.5 feet on June 29th, and over 2 feet today. The discharge exhibit also shows a series of small triangles, depicting what the average stream discharge has been each day over the last 13 years. Over the two week period represented in the exhibit, the average daily streamflows ranged from 30 to 60 cfs.